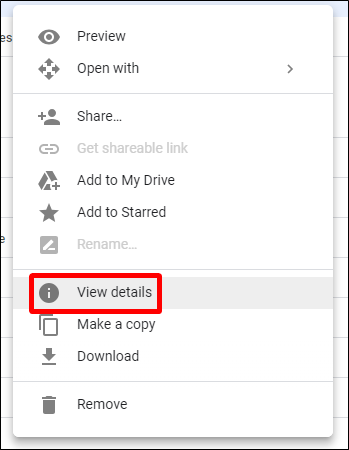 Google Drive’s sharing system is the problem. Since it doesn’t offer any sharing acceptance, all files and folders shared with your account are automatically available to you in Drive—they just show up. To make matters worse, if you only have “View” permission, you can’t remove yourself from the share. It’s a mess. And to make matters even worse, this is far from a new problem, but Google still hasn’t done anything to fix it. 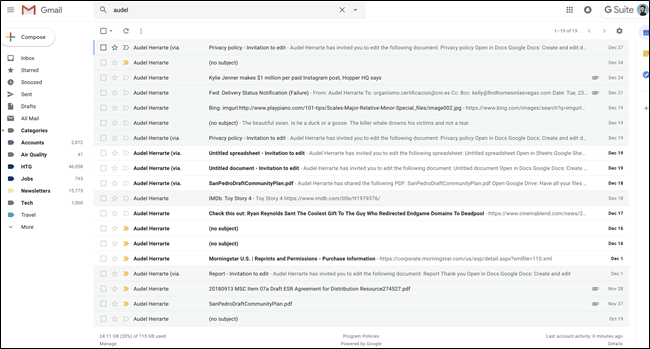 Here’s the scenario: a spammer (or anyone else) shares a file or folder with you. This file or folder immediately shows up in the “Quick Access” area of your Drive, as well as in the “Shared with you” section. You can’t stop this from happening—you don’t have to accept the share; it shows up whether you want it or not. The good news is that the files aren’t automatically added to your Drive, and are thus not downloaded or synced automatically to your devices. These were all shared with us without request or permission. Yet here they are. Now, you can right-click on the item and choose “Remove” to prevent it from showing up in the “Shared with me” section, but it will continue to show up in the Quick Access area and search results. If you accidentally open the file or folder, it will be added back into your Drive on the web. There are a few scenarios in which this is a pretty big issue. The first, as mentioned earlier, is for spam. Users can (and will) get bombarded with crap they don’t want—all the time. The second issue may be even more common: when you don’t want to be part of a shared file/folder any longer. Since there’s no way to remove yourself from the share, you’re stuck with it. This can be especially troubling if the shared file or folder is from an ex with whom you no longer have or want contact. To make matters even worse, Google Drive doesn’t offer a block feature. Even if you block someone in Gmail, it doesn’t block them in Drive. That seems to be a common thing with Google services—just because you block someone in one service doesn’t mean they’re blocked in any of the others (but maybe sometimes they are?). It’s a mess. Yeah, that’s old. Like, “from a previous marriage” old. All that said, Google Drive does offer spam reporting—but when we tested the feature, it directed to a 404 page half the time. When it did work, the document still wasn’t removed or blocked from Drive. Not a good look for Google on either count. 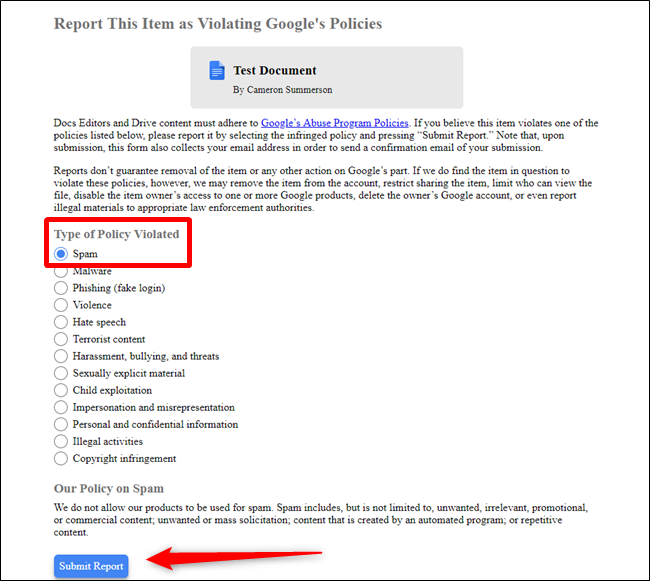 The most frustrating part of this issue is that the solution is so simple: Google needs to add an acceptance feature and a removal feature that works. 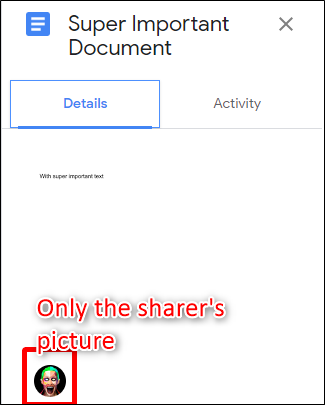 With Dropbox, when someone shares a file with you, you have to accept the share before it shows up in your Dropbox. If you never accept the file, guess what? It never shows up in your Dropbox folder. 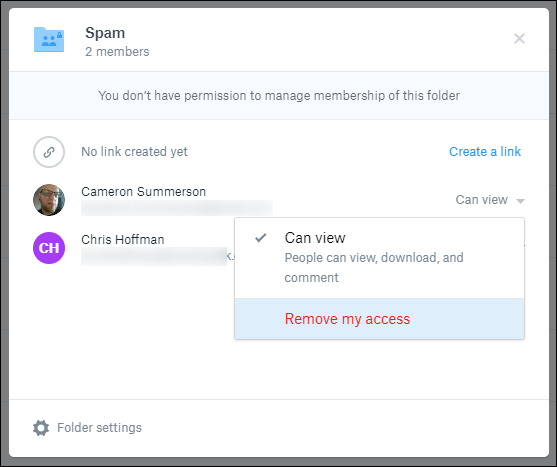 Also in Dropbox, the user is free to remove themselves from a shared file or folder even if they’re set to “can view” status. That’s a huge advantage over Drive and something Google should steal from Dropbox. That’s the hell of it: there’s nothing you can do. You can’t stop people from sharing files or folders with you, and you can’t remove yourself from shares once they come in (again, this only applies if the file is set to “view only”). 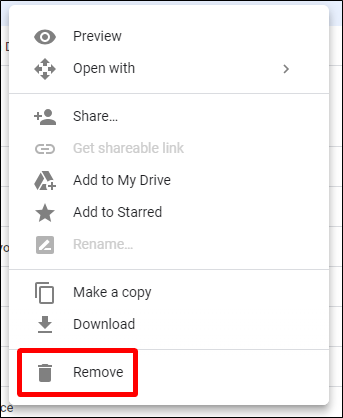 You can right-click on the file and choose “Remove” to hide it from your “Shared with me” list, but as we mentioned earlier, the file or folder will still show up in your search results and Quick Access area. It’s better than nothing, but not by much. If you see your profile picture alongside whoever shared it, then you have editor privileges, and you can remove yourself from that share. 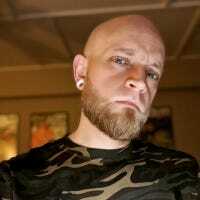 If you only see their profile picture, then you can only view the share, and you’re stuck with it. 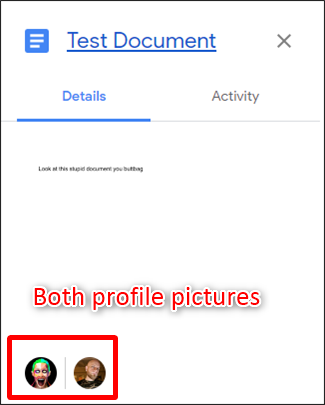 You can also try marking shared files as spam, but the use is very limited—it only works with Google Docs files (Docs, Sheets, Slides, etc.). Any other kind of file is off limits. Update: We incorrectly stated that this only works in Docs, Slides, and Sheets, but it actually works for all file types. 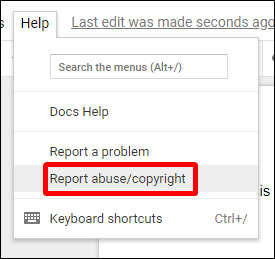 Just double click the file on the Drive site, then click the three dots in the upper right corner and select “Report abuse.” The following instructions cover how do report a Google Docs file. On the next page, choose “Spam” as the violation you’re reporting. Click on “Submit Report,” and that’s that. The file will still be in your Drive, and it’s unclear what Google does with this information. I reported one file, and it was still in my Drive four days later, so do with that what you will. Otherwise, you’re just out of luck, at least for the time being.